The Invicta Speedway watch is a quartz chronograph with a design that is influenced by the Rolex Daytona. Given this influence, it is the Daytona to which I will be making comparisons. Although this review is for the stainless steel model, the 9211, it is still applicable to the other models, which are identical with the exception of their finish. Unlike the Daytona, which has a Swiss automatic movement, the Speeway uses a Japanese quartz movement. As is typical with many quartz movements, it has a hacking function when the crown is pulled fully out, which stops the second hand, allowing the exact time of day to be set. The second hand, unlike the Daytona, is not one of the subdial hands, but shares the same axis with the hour and minute hands, as is common with conventional time-only watches. When the second hand ticks to a new marker, it sometimes bounces backwards slightly. While this is somewhat visually distrurbing, it doesn't affect timekeeping in any way. Also disturbing, is that the second hand doesn't necessarily tick on the second marks. Sometimes it will overshoot, sometimes it will undershoot, and the odd time it will land exactly where it should. Again, this doesn't affect timekeeping. The chronograph movement is a bit disappointing because its operation is considerably different than a Daytona. The center axis second hand on the Daytona is used as part of the chronograph function to measure elapsed seconds. On the Speedway, this hand, as already mentioned above, is used for normal timekeeping. Instead, elapsed seconds are measured on the subdial above the six hour marker. On the Daytona, this subdial is used for elapsed minutes. The Speedway's elapsed minute subdial is beside the nine hour marker and can time up to sixty minutes. This is considerably shorter than the twelve hours the Daytona is capable of because there isn't a subdial for measuring hours on the Speedway (on the Daytona, this dial is also beside the nine marker). The final subdial, by the three marker, shows the hour in 24-hour format. 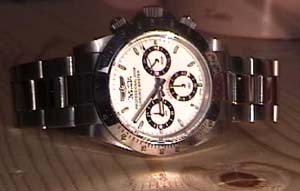 It is unfortunate that this subdial was not used to show the date, as is done on the Daytona. Opeartion of the chronograph is straightfoward. The top pusher starts and stops time measurement. If the bottom pusher is pushed and the chronograph is operating, the mechanism is paused so the value may be read, but internally the counter is still ticking away. Pushing the bottom pusher a second time resumes the hands. If the chronograph is stopped, pushing the bottom pusher resets the hands to zero. The hand on the minute subdial on my watch leans at about -1 minute when in the zero position. This is likely a quality control issue. The case on the 9211 is high quality stainless steel and has a nice heft to it. The sides are polished and the front is brushed. It's very much on par with the Daytona. The fixed bezel is highly polished and quite attractive. In black ink around it are numbers that correspond to speed in "units per hour". The idea is that the watch will do a speed calculation for you. For example, let's say you are timing a 1-mile lap and press start button. When the you press the button 30 seconds later, the second hand (if this were a Daytona) would line up with 120 units per hour. Doing the math, we see that if we can do that 1-mile lap in 30 seconds, we are doing 2 miles in 60 seconds, or two miles per minute. In an hour that is 120 miles per hour, which matches the Speedway's figure (more or less, given the bezel alignment issues). The watch is in units per hour because it doesn't matter what unit you are using, miles, kilometers, or whatever--it just works. But, of course, this isn't a Daytona, it's a Speedway, and the second hand isn't used for chronograph purposes, so reading where it is against the bezel will be meaningless. It's the subdial above the six marker that shows the seconds. To figure out units per hour, you'll have to mentally project that dial onto the face of the watch and take a reading. Obviously, the Speedway isn't really meant to be used at the track. Another negative issue with using it at the track is that the bezel doesn't line up correctly with the face. One my watch, and indeed others that I've looked at, it is slightly off by nearly half a second. Cosmetically, this is displeasing, and speaks poorly of Invicta's quality control. The mineral crystal sticks up slightly from the watch's bezel and there is little to complain about. Perhaps the only thing worth mentioning is that the inside edges sometimes look blue/green/grey depending on the lighting. The screw-down crown has a nice beefy feel and thickness to it. It unscrews and screws easily and without much effort. There is a bit of "crunchiness" while working it, but not so much so that its distracting. The face of the crown has a Swiss-type cross in a square; a very nice touch. Above and below the crown are screw-down pushers. They have a much smoother screw/unscrew action than the crown itself and are a pleasure to handle. The white dial on the 9211 is very attractive and it is hard to tell with anything less than a more-than-casual inspection that it isn't a Daytona. The subdials at three, six, and nine, are black with white writing. Above the subdial at six is, in bright red writing, the word SPEEDWAY, which curves nicely along the dial's edge. Below the 12-o'clock marker is a silver Invicta logo. Beneath that are the words PROFESSIONAL 200M CHRONO-MASTER. The hour markers are chrome and have Invicta's custom luminous paint, tritnite applied in the centers. Tritnite is notorious for its lack of staying power, making the watch very difficult to read in the theater or in darkness. Chrome hands just don't work against a white face. I know that Invicta has access to black hands, so why they don't use them on the Speedway is a mystery. It takes a longer-than-normal glance to be able to read the time. The hour and minute hands are thin and straight, with a fine black line running their length. Inset on each hand is the same tritnite paint that is used on the face. The second hand is thin and ends with an arrow point. Quartz, being what it is, is an exceptional time-keeper; during the six months that I have owned the Speedway, it has not required any adjustment. The bracelet that comes with the watch is really top-notch as far as flip lock bracelets go, and very similar to the one used on the Daytona. It is a thick 4mm and has a heavy clasp that has no sharp edges. The watch came in the normal bright-yellow Invicta box with the normal generic instruction manual. The weight and bracelet of the watch make it very comfortable. I have yet to pull any hairs. I do notice that the back of my hand sometimes makes contact with the crown, which can be painful when pushing open a heavy door. The first serious improvement that I would like to see is more attention paid to quality control regarding alignment. The effort required to ensure the bezel and subdial hands are straight cannot be considerable. In a watch as well made as the Speedmaster, it's a pity that they can't align such components with any consistency. I'd also like a better luminous paint used on the face and hands. Tritnite, with its shortcomings, just doesn't do it for me. Finally, I'd like to see a better movement in the watch. This doesn't necessarily mean an automatic one, however. I'd like to have the second hand do what it's supposed to do, and be able to tell what the date is. I paid $110 for the watch, and all things considered, it's a steal at that price. I'd gladly pay $250 or more if the issues I addressed above were resolved. Overall Score: 7/10 with points lost for the movement, bezel and subdial alignment, and luminous paint.